Lyka Edna Masgay is a healthy little girl living in the Philippines. One year ago, this did not seem possible. While some insist that it was merely the hands of skilled surgeons that saved her life, others understand it was Save a Child’s Heart’s belief in the Jewish tradition of tikkun olam that motivated this remarkable team of dedicated surgeons, paediatricians, nurses, transport teams, donors and volunteers to assume collective responsibility for the lives of children, like Lyka, around the world. Lyka’s story began in the Philippines where she was born in 2008 with congenital heart disease and little to no hope for survival. When Lyka was only eight months old, her grandmother made a plea to Save a Child’s Heart (SACH) to save the life of this fragile, critically ill little girl. The logistics involved in securing the transport of Lyka to Israel alone was seemingly insurmountable, but this did not deter SACH. A complex plan was coordinated for her care and transportation. Once in Israel, Lyka was immediately taken to the Wolfson Medical Center where she was stabilized. Two months later, following a catheterization procedure and later an open heart surgery, Lyka was able to return home to live a healthy and normal life. She was the first Filipino child that SACH brought to Israel for life-saving surgery. Lyka’s story is just one of countless stories of children who are given a second chance for life by SACH. SACH, though working to save children’s lives worldwide, focuses on the individual needs of each child, one child at a time. The comprehensive care they provide is given irrespective of religion, race or nationality. It is an organization dedicated to finding hope when there is seemingly little. SACH is an NGO and a non-profit organization based in Israel, but the work they do is possible through donations from around the world. There are SACH registered charities in the US, the UK, Canada, France, Holland, Germany, Ghana, Vietnam and Kenya. SACH is now in the process of also registering SACH Australia. SACH medical teams, equipped with a portable echocardiography machine, travel to partner sites in developing countries in order to evaluate pre- and post-operative patients together with local cardiologists. Following the children’s examination, the SACH medical team, which includes two physicians, at least one of them a cardiologist, decides together with the local partner on a list of children requiring heart surgery or catheterization. This list will be used by the local team to prioritize the cases and determine who should be sent for surgery and when, depending on available funding. The cardiology clinics also provide essential follow-up care for children who were previously treated by SACH. A fully equipped SACH medical team travels to partner sites in order to teach as well as perform life-saving heart surgery for children with congenital heart defects and acquired conditions as well. During the missions, the medical team will work alongside local personnel, who in many cases have already been trained in Israel through the SACH program. To date, 14 teaching missions have taken place in China, Ethiopia, Mauritania, Moldova and Ukraine. These missions have resulted in the treatment of more than 130 children and the onsite training of hundreds of medical personnel. The ultimate goal of SACH is to create centers of competence in developing countries where children can be treated independently. SACH trains medical personnel from partner sites in Israel at the Wolfson Medical Center. There in-depth post-graduate training programs vary from three months to five years and are all held under the auspices of the Sackler School of Medicine of the Tel Aviv University and the Center for International Cooperation of the Foreign Ministry of Israel (MASHAV). Since its inception in 1995, SACH has trained 50 physicians and nurses from China, Ethiopia, Moldova, Nigeria, the Palestinian Authority, Eritrea, Kenya, Russia, Vietnam and Zanzibar. The depth of their commitment to save the lives of children, irrespective of race, religion or nationality, is the very core of their mission. Weekly, children from the neighbouring Palestinian Authority are referred to the SACH program. Since 1995, more than 3,500 Palestinian children have been examined at the weekly cardiology clinic, part of the EU Partnership for Peace Program, “The Heart of the Matter Project.” This program brings together Palestinians and Israelis by providing cardiac care to Palestinian children and outreach training programs for physicians from the Palestinian Authority. Dr. Lior Sasson, lead surgeon for SACH, though personally responsible and involved in the care of thousands of cases, is still touched by the individual cases. When asked if there is one case in particular that has had a lasting impact on him, he tells the story of a child from the Palestinian Authority who arrived at SACH and was thought to be already dead. The child required resuscitation before surgery. This was really a case where there was little hope but the SACH team fought hard and was able to save the child. It is the smile on the mother’s face and her look of relief that he carries with him. Regionally, SACH has treated children from China, Vietnam, the Philippines and Sri Lanka. Currently, in Israel, they are treating Yuqing Xie, a thirteen year old girl from China, as well as children from Africa, the Palestinian Authority, Iraq and Romania. One of the main medical partners of SACH is the Hebei Children’s Hospital (HCH) in Shijiangzhuang, China, though SACH also has partnered with the 1st Affiliated Hospital of Lanzhou Medical School. The HCH and SACH have been working in close cooperation since 1999 to improve the cardiac healthcare for children in Hebei Province in China. In November 2009, the first international seminar on “Congenital Heart Disease in Babies Under One Year of Age” took place in Hebei Children’s Hospital. Guest lecturers at the seminar were Professor Edward Bove, renowned Pediatric Cardiac Surgeon from the University of Michigan, and Dr. Lior Sasson, Head of the Cardiothoracic Surgery Department at the Wolfson Medical Center. 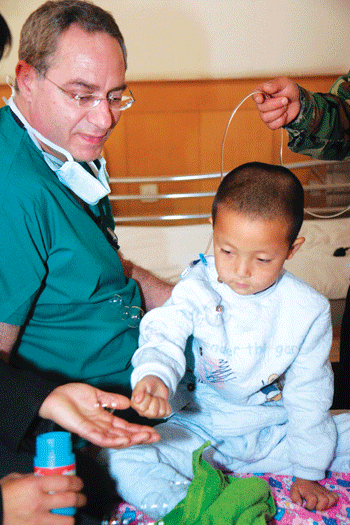 Since 1998, SACH has sent eight medical missions to China and 116 Chinese children have been treated by SACH in China and in Israel. Seven doctors and eight nurses from China were trained by SACH in the Wolfson Medical Center. Regionally, SACH has also trained a pediatric cardiologist from Vietnam and is working in cooperation with Children’s Hospital No. 1 in Ho Chi Min City. In 2005, just after the tsunami, SACH brought 8 children from Sri Lanka, to Israel for life saving heart treatment. This was made possible through the assistance of international aid organizations and the Israeli organization “Israel Flying Aid” who were active in Sri Lanka after the tsunami. As part of the efforts to raise awareness and reach potential supporters and donors throughout the world, SACH launched an international photography exhibition, a joint project of SACH and the Israeli Ministry of Foreign Affairs which was launched to mark the 60th anniversary of Israel. This travelling exhibition features touching photographs taken by seven photographers of children treated by SACH. Regionally, the SACH photography exhibition has been displayed in Australia, Singapore, the Philippines and China. In November 2008, the photography exhibition was displayed in China and was officially opened in the Hebei Children’s Hospital in the presence of the Vice President of Hebei Provincial Government, Sun Shi Bin, and the SACH medical team who had just finished a medical teaching and surgical mission at the hospital. Most recently, in November 2009, the exhibition has been displayed in the Japan International Cooperation Agency offices in Tokyo. For more information about SACH, please refer to their website at www.saveachildsheart.org. The photographs in this article are the work of SACH photographer Sheila Shalhevet. The information was provided to AJL directly from the team at SACH.